Weather is playing really a weird game. Few days it is super hot and other days it has gone cold. As the weather changes, my skin tends to change too. In summers it is hot and as soon as it gets colder, it gears towards drier sides. I tried this Lakme sunscreen during this time. Today I am going to review Lakme Sun Expert Fairness+ UV Lotion SPF 24 PA++ which is priced at Rs 170 for 60ml and Rs 325 for 120ml. 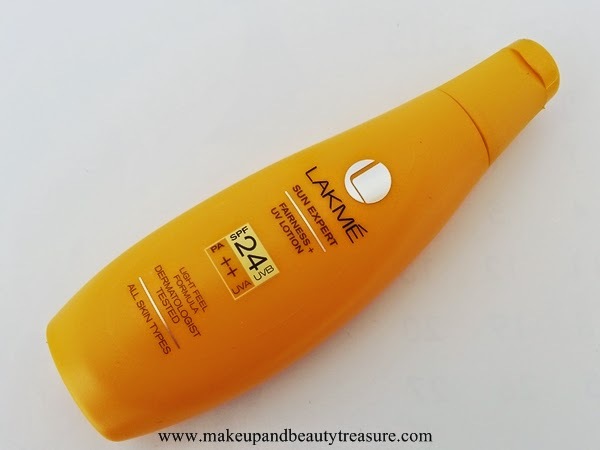 Lakme Sun Expert Fairness+UV Lotion SPF 24 PA++ comes in a bright summery yellow color with a flip top lid. The packaging looks stylish with its slightly curvy shape. It has got flip open lid which is very convenient while traveling. The packaging is quite lightweight and can be easily carried around in a bag without any fear of leakage or spillage. The lotion is light yellow in color with mild and pleasant scent. 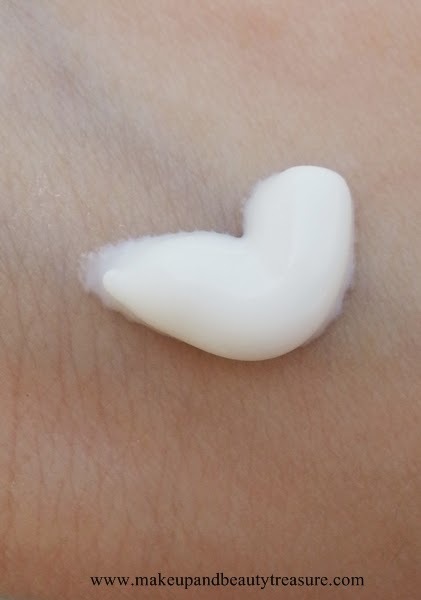 The texture of the sunscreen is soft and smooth with perfect consistency. It is neither very thick nor very thin. It spreads easily and gets absorbed quickly without leaving a greasy residue behind. It is quite moisturizing and I don’t feel the need to moisturize my oily (and even dry) skin prior application. It has been instructed by the company to apply sunscreen 10 minutes before any sun exposure. The sunscreen makes my skin soft, smooth and healthy. It does not make my skin oily for a good 3-4 hours. I usually set it with powder to ensure longer stay of the product. It doesn’t feel heavy or give whitish cast to my face unlike other sunscreens. When my skin is oily, my T-zone starts getting oily after 4 hours. The sunscreen works well for dry skin pretty well without making T zone oily for a longer time. I have not faced any adverse effects whilst using this sunscreen. The sunscreen has SPF 24 PA++ but as I do not spend prolonged periods in the sun, I have not faced major tanning issues. It comes in three SPF strengths- SPF 24, SPF 30 AND SPF 50 so you choose accordingly. The sunscreen is meant to be reapplied frequently. I usually wipe it off with a tissue or wipe before reapplication. Though they have named it as fairness lotion but I have not seen any changes in my skin tone. After coming home from scorch heat, I love washing my face with Lakme Sun Expert Skin Lightening+De-Tan After Sun Face Wash. I loved the summery color! • Gives a healthy look to my face. • Will not suit oily skin. • If you spend prolonged periods in the sun then it might not work effectively but you can always choose high SPF strengths. 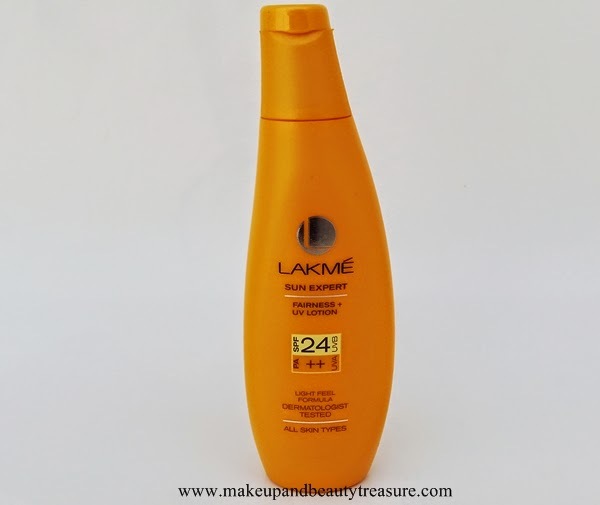 Lakme Sun Expert Fairness+UV Lotion SPF 24 PA++ is a great option if you spend a short period of time under sun. It is quite moisturizing and I do not feel the need to use a separate moisturizer. It gets absorbed quickly and does not give whitish cast to face. I would definitely recommend it to people with normal and dry skin. 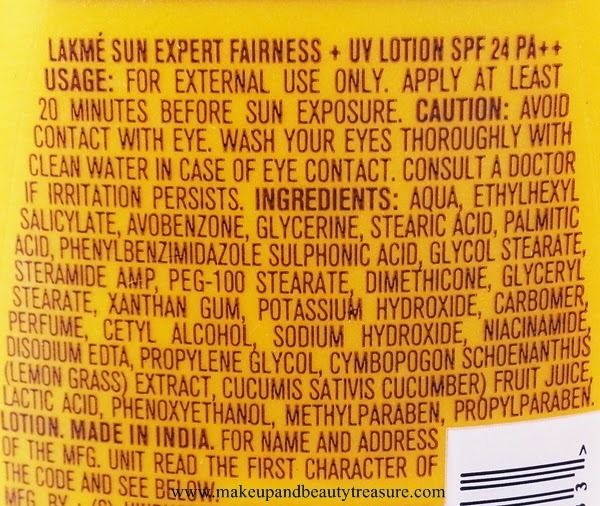 Have you tried Lakme Sun Expert Fairness+UV Lotion SPF 24 PA++? What is your favorite sunscreen? Share in the comments section below! 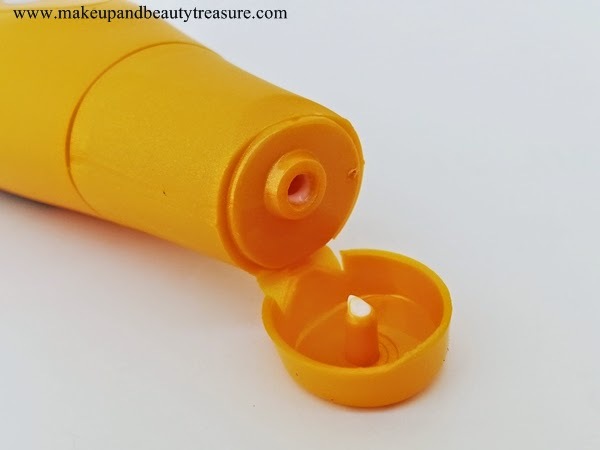 This sunscreen has avobenzone, a chemical sunscreen ingredient which is very unstable with UV rays. these chemical sunscreen agents will actually age the skin faster than it's original age. It is better to go for sunscreen with zinc oxide or titanium dioxide which are physical blockers and also very safe to skin. Avobenzone is a great uva filter when used in conjunction with other ingredients that help to stabilize it!!! But I agree with you sunscreens with zinc oxide or titanium dioxide are gentler and safe on skin!!! my skin type is a combination one.so could you please suggest me which sunscreen is good for my skin without making it even more dull,whitish patchy,acne prone. You can try suncote gel! I have reviewed it on my blog!